The LT1361 LT1362 are dual and quad low power high speed Operational Amplifiers with outstanding AC and DC performance. The Amplifiers feature much lower supply current and higher slew rate than devices with comparable bandwidth. The circuit topology is a Voltage Feedback Amplifier with matched high impedance inputs and the slewing performance of a Current Feedback Amplifier The high slew rate and single stage design provide excellent settling characteristics which make the circuit an ideal choice for data acquisition systems. Each output drives a 500 Ohms load to 13V with 15V supplies and a 150 Ohms load to 3.2V on 5V supplies. The Amplifiers are stable with any capacitive load making them useful in Buffer or cable driving applications. The LT1361 LT1362 are members of a family of fast, high performance Amplifiers using this unique topology and employing Linear Technology Corporation,s advanced bipolar complementary processing. For a single Amplifier version of the LT1361 LT1362 see the LT1360 data sheet. For higher bandwidth devices with higher supply currents see the LT1363 through LT1365 data sheets. 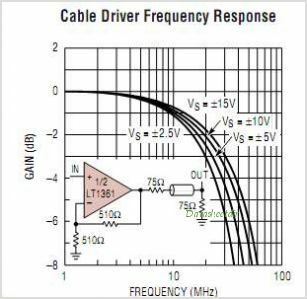 For lower supply current Amplifiers see the LT1354 to LT1359 data sheets. Singles, duals, and quads of each Amplifier are available. This is one package pinout of LT1362,If you need more pinouts please download LT1362's pdf datasheet. 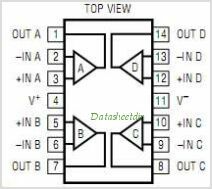 This is one application circuit of LT1362,If you need more circuits,please download LT1362's pdf datasheet.